I was planning on saving this review for Wednesday as I am supposed to be heading to Liverpool tonight to see Regina Spektor in concert. 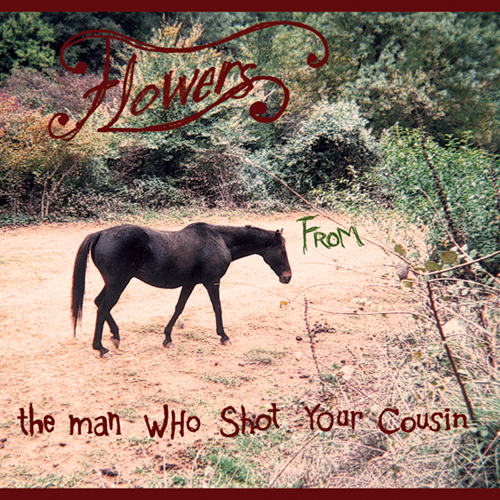 However, I couldn't resist but to ramble on about Flowers From The Man Who Shot Your Cousin (FFTMWSYC). Anybody who has listened to the We♥Music Podcast will know I am becoming a big fan. I have spent all day listening to the FFTMWSYC's album, Hapless. I doubt very much it will be leaving my playlist any time soon and it is destined to hit my car stereo in the near future. It is gentle folk and genuinely relaxing with insightful lyrics. In this day and age, I doubt there is a modern folk singer alive who doesn't list Leonard Cohen as an influence of some sort. Morgan is no different. The thing that sets Cohen part from the rest, in my opinion, is he is a powerful lyricist. Cohen relies heavily on his poetic background to cover up the fact he isn't the world's greatest vocalist. That's right, you may not have notice, Cohen doesn't have that beautiful a singing voice but hell, he has a magic that comes from his lyrics. Morgan isn't Cohen. I don't think he'd mind me pointing that out because Cohen is a one-off, a classic. But FFTMWSYC is special. In terms of singing ability, it is Morgan's vocals make his songs so mellow. Of course he is aided by the softness of his guitar. With no reluctance, I am happy to declare this man has a beautiful voice. But there are a lot of singers out there with great voices. Where Morgan comes into his own is in his lyrics.� I could throw adjectives, such as soulful, reflective and deep, at you but it is better to hear his songs first hand than for me to detracted from his abliity to capture real life moments and enlightened thoughts. I am assuming his lyrics have been shaped by his travels between continental Europe, where he was born, and continental America, where he has spent a great deal of time. Regardless, each song contains a different treasure to be discovered; whether it be in betraying an old friend with his new wife (Sweet Wife) or in searching for a vast forest and only finding a branch (The Branch). During the 90s, Morgan released a number of records as part of the French group, Loons. Here at We♥Music, we are aware you love covers. The Loons released a twee cover of France Gall's "Ne sois pas si bete", which is available to listen to here and can be downloaded at their last.fm page. However the music of FFTMWSYC is far from twee. It is definitely folk and positioned on the darker side of folk. One of the highlights of Hapless is the wonderfully bitter "I Do Not Love You Anymore" which contains the glorious line, "The things you said I did so well, I did them all to someone else." This is a fine example of the dry wit that is found throughout the album. The song I have chosen to share here, "Lay Down Your Arms", is just as well crafted as "I Do Not Love You Anymore", and definitely a lot more beautiful in its subject matter, a plea from one lover to another. It has already featured on the We♥Music podcast but I love it so much I thought I'd post it again. If you are interested in learning more about the man behind FFTMWSYC, check out his interview over on 8hands and find out why he may travel your home and smother you in your sleep. Moreover, you can listen to his appearance on New York Public Radio's Spinning On Air with the smooth sounding David Garland. If you don't want to listen to the broadcast in full then fast forward 20 minutes in and you'll find Morgan's songs. Morgan is a man with a definite web presence. He can be found at last.fm, myspace, virb and MOG. I get the feeling he is a member of these sites more to discover new music than to promote his own. This September FFTMWSYC will be found touring the major cities of France with the wonderful June Madrona. There is also the possibility of a UK tour with Kevin House. If you've liked what you've heard here, there are free downloads available at FFTMWSYC's last.fm page and streamed tracks on myspace. Hapless can be purchased at Bicycle (USA) and Drunk Dog Shop (Europe). It is definitely a good sign that the Bicycle store is currently sold out. I stumbled upon Flowers From The Man Who Shot Your Cousin only a few days ago so I don't claim to have a vast knowledge of his works. Although, I will confess I was tempted to head to Lyon on 15 September 2007 to catch up with an old French friend and catch one of his shows. However, in a very un-rock and roll fashion, I have doctor's appointment that day and my bank manager would probably issue bankruptcy proceedings against me. If you are looking for a chilled-out, challenging album then I recommend you sample Morgan's Hapless. As behind the unusual name, Flowers From The Man Who Shot Your Cousin, you'll find a stunning collection of folk songs crafted by a sophisticated soul.